I’m pleased to welcome fellow Sister in Crime Gigi Pandian as today’s guest on the blog. 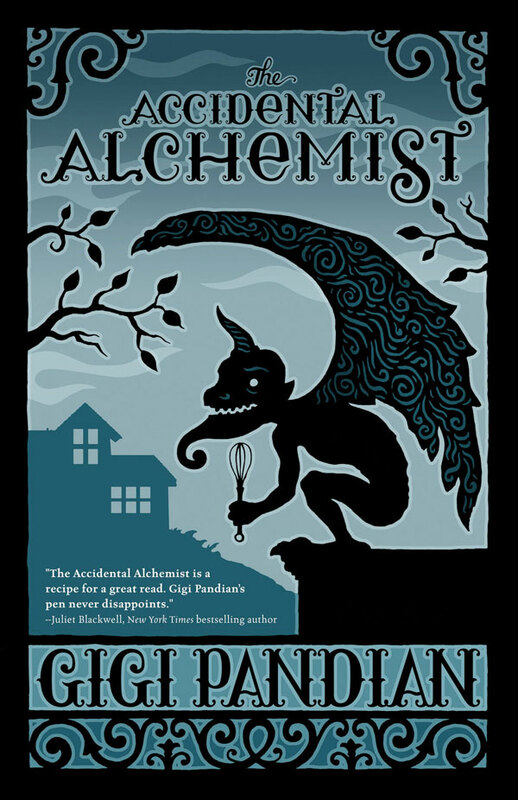 Gigi and I share a fascination with gargoyles, the subject of her post, and Gigi’s latest mystery, The Accidental Alchemist, features a centuries-old female alchemist and her impish gargoyle sidekick who was accidentally brought to life by a French stage magician. Take it away, Gigi! I’ve always been fascinated by gargoyles, so when I began writing a paranormal mystery about an alchemist, the gargoyle character ended up taking over the story! I’m not alone. Gargoyles have fascinated people for millennia. Though they were most popular during the medieval era in Europe, the first known use of gargoyles was in ancient Egypt. Nobody has the definitive answer as to why drainage pipes were anthropomorphized as gargoyles, but many different forces contributed to their rise in popularity. Gargoyles reached the height of popularity in 13th century Europe. Since they look like tormented souls, and were often used on cathedrals in medieval Europe, one common theory is that gargoyles symbolize trapped souls, showing people they would be safe once they entered the interior sanctuary of the church. Within this theory, it’s up for debate whether or not those tormented gargoyles were trapped human souls, fierce guardians warding off the devil, or creatures ready to harm people who didn’t attend church. As with much religious interpretation in the Middle Ages, it’s likely that all of these interpretations were used. After all, most people were illiterate, so different ideas spread in different areas. But what was the intent of the stone carvers themselves? Gargoyles provided an outlet where they could let loose with their creativity. Historian Janetta Rebold Benton speculates that gargoyles have always fascinated people because we’re naturally drawn to the mysterious and the macabre. 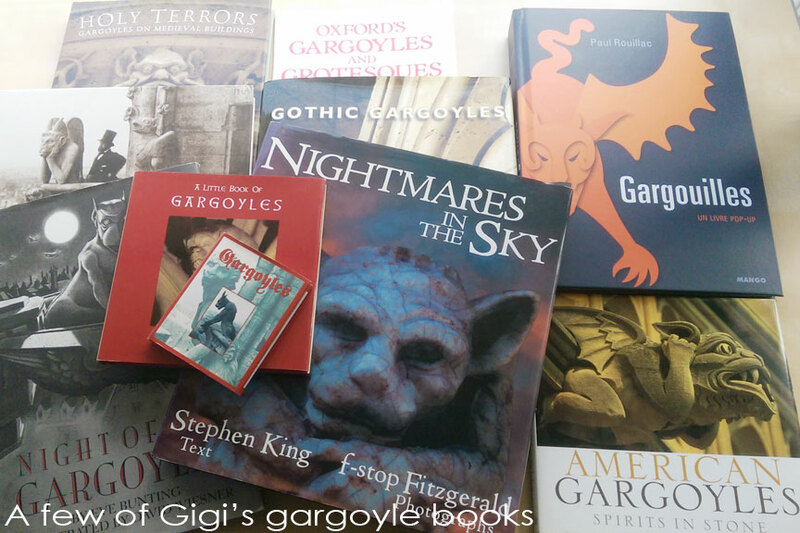 “The modern horror movie,” she says, “like the medieval gargoyle, pretends to threaten us but does no harm.” And yes, I do read books about gargoyles by historians! Technically, a gargoyle is a water spout used for draining rainwater away from a building. But over time, the term has come to be used more broadly, applying to ornamental grotesques perched on buildings. And today, many of these modern “gargoyles” are have a much more benevolent appearance. The gargoyles of Notre Dame in Paris are even said to keep watch for anyone drowning in the Seine. Architect Eugène Emmanuel Viollet-le-Duc was the man who created the gallery of gargoyles at Notre Dame, during the cathedral’s restoration in the 1800s. Those famous gargoyles are a “new” addition to the old cathedral. 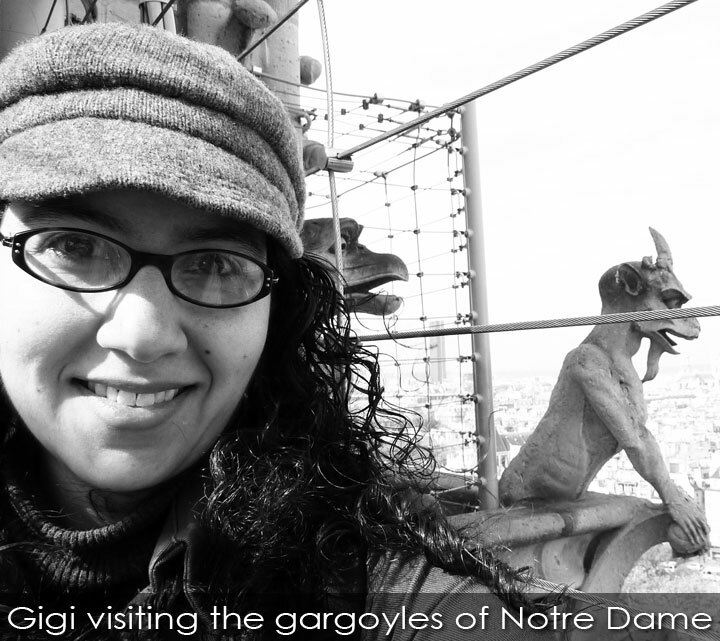 I love to use real history in my novels, so in The Accidental Alchemist, I created Dorian the gargoyle using the real history of Notre Dame. 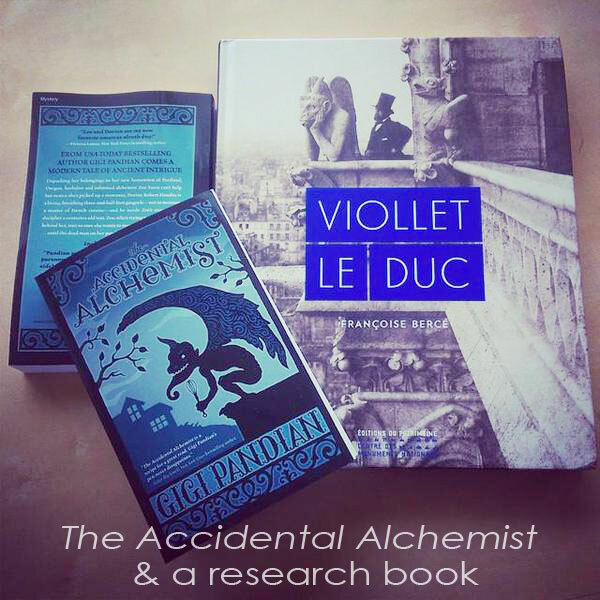 Both Viollet-le-Duc and famous stage magician Jean Eugène Robert-Houdin are important figures in the Accidental Alchemist series. The Accidental Alchemist is the first in a series, so there’s plenty more fun with gargoyles to come. In The Accidental Alchemist: Unpacking her belongings in her new hometown of Portland, Oregon, herbalist and reformed alchemist Zoe Faust can’t help but notice she’s picked up a stowaway. Dorian Robert-Houdin is a living, breathing three-and-a-half-foot gargoyle—not to mention a master of French cuisine—and he needs Zoe’s expertise to decipher a centuries-old text. 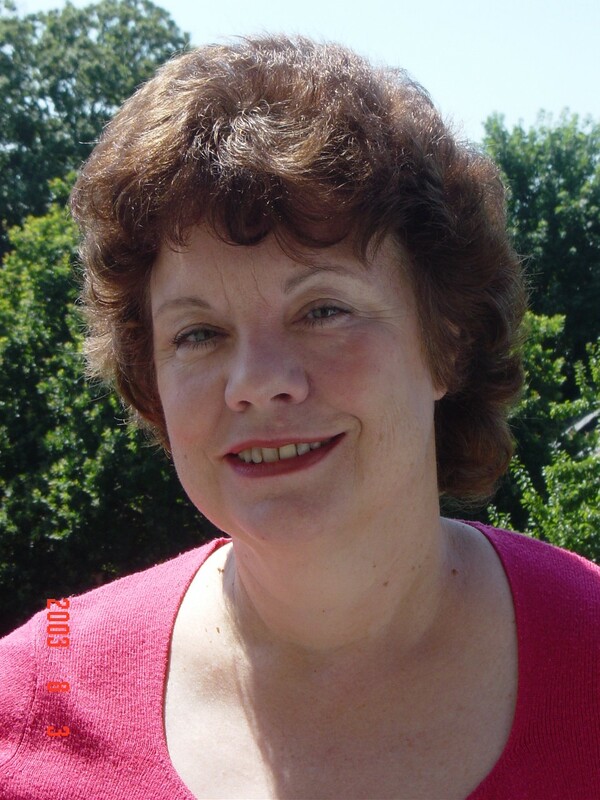 Gigi Pandian is the USA Today bestselling author of the Jaya Jones Treasure Hunt mystery series (Artifact, Pirate Vishnu, and the forthcoming Quicksand) and the new Accidental Alchemist mysteries. Gigi’s debut mystery novel was awarded a Malice Domestic Grant, and her short fiction has been short-listed for Agatha and Macavity awards. Gigi spent her childhood being dragged around the world by her cultural anthropologist parents, and now lives in the San Francisco Bay Area. Find Gigi online at www.gigipandian.com, connect with her on Facebook (facebook.com/GigiPandian) and Twitter (@GigiPandian), and check out her gargoyle photography on the Gargoyle Girl Blog at http://www.gargoylegirl.com/. Please welcome guest Amber Foxx to this week’s Saints and Trees. Amber writes the mystery series featuring healer and psychic Mae Martin. Amber’s professional training and academic studies in various fields of complementary and alternative medicine, as well as her personal experience and travels, bring authenticity to her work. She divides her time between the Southeast and the Southwest, but Truth or Consequences, New Mexico is HOME. SAT: Although part of the Mae Martin series, your new release differs from its predecessors in some noticeable ways. For me, the biggest change was the pace. While still character driven, Snake Face reads like a heart-stopping thriller, whereas the first two books, though certainly page turners, didn’t have me figuratively biting my nails throughout. Given the plot premise, the pace and anxiety level had naturally to follow, but I’m curious to know if you were consciously aware of that when you were writing. AF: I like to vary the genre blend, and change the mood and the pace from book to book. If I’m going to be realistic with a series that’s not about murder or law enforcement, my protagonist’s life is going to vary that way. Each book will have a different feel. The Calling is more of a “paranormal realism” novel, with the mystery secondary to the development of Mae’s gift and her personal struggles in her family and her town. It’s been reviewed as literary fiction—with some disagreement also—but the pace is more like a literary novel than a conventional mystery. In Shaman’s Blues the mystery of Jamie’s layers of secrets is as important Muffie’s disappearance. I thought of it as an un-romance, with that genre turned upside down in many ways, as well as a mystery. As far as intending to write a nail-biter for the third book, I was very much aware that Snake Face was a departure from the previous books. I knew it would be as soon as I decided to write almost half the chapters in Jamie’s point of view. His emotional life tends to go over the speed limit, so that, as well as the plot, affected the feel of the book. 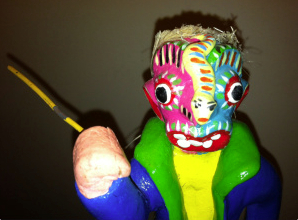 SAT: You state on your blog that the title, Snake Face, comes from a folk art statue you purchased in New Mexico. Did this statue spark the idea for the book, or did the connection occur to you later? AF: The book was well along when I found the little snake face man in Mesilla. I have a few Oaxaca nightmare-art figurines, such as the two-headed winged deer that’s briefly mentioned in the book. (It is really evil-looking, but also beautiful.) The snake-face statuette intrigued me. Instead of portraying the creatures of the nightmare, it’s an image of the man who’s having the terrible dream. He has a snake crawling down his nose while he’s waving a useless little stick at it. The woman who sold it to me said, with a kind of empathy, “He’s fighting them off as best he can.” I gave Jamie that line, when he admires the figurine as part of the décor in a bar in Mesilla. The snake-face image was a perfect fit for the way Jamie often feels in this book. SAT: So where did the idea for this particular book in the series come from? AF: Before writing Snake Face, I’d written a scene that I never used in which a fortune teller in Santa Fe does Tarot readings for Mae and Jamie. (I recycle my works in progress into many forms before they finally come out.) Anyway, I drew cards for them and studied the meanings, and came up with a plot for book three from that. The suggestions from the cards became the plot when I interpreted them in terms of challenges that would disrupt their lives. Given Mae’s marital history, starting a new relationship is a huge step, and then running into Jamie again adds another difficulty to that situation—one she isn’t prepared for. For Jamie, going on tour is progress for his career, but it’s also incredibly hard for him in many ways, above and beyond the road warrior aspect of it, due to—well, Jamie being Jamie. From the Tarot reading, I started with an image of him at a rest stop halfway across the country, where he realizes something awful has happened, and I worked forward and backward from there. The antagonist character showed up for me the way Jamie showed up, fully formed. I revised the book for two years, changed almost everything about it—but that turning point disaster never changed. SAT: Jamie’s background is training in opera and his current career showcases his musical talents as a “world music” performer. You mention elsewhere that Jamie simply “came” to you, one of those wonderful gifts any writer would be grateful for. When describing his musical performances, did you have any particular artist or style in mind? AF: When Jamie showed up, he showed up as a tenor. In my never-written backstory, Jamie’s parents took him and his older sister to the Sydney Opera House to see The Magic Flute when he was a musically gifted child of around eight years old, and he fell in love with opera. Whether it’s comic or tragic, it’s larger than life, and so is he. Before his family settled in Santa Fe (which has its own amazing opera house), he grew up off and on in Australia and also all around the world. With his father being an anthropologist studying shamanic cultures, he had contact with ceremonies like the Korean mudang’s ritual described in Shaman’s Blues. Such ceremonies have a lot of wild color and sound, music and dance. In addition to these influences I had some elements of Robert Mirabal’s shows in mind, though I was not directly modeling on Mirabal. He’s a singer, dancer, composer and flute maker from Taos Pueblo. He plays, as one might expect, the Native American cedar flute, and he also plays didgeridoo and drums, and he dances. I’ve seen him leave the stage at Santa Fe Bandstand and dance with his audience. Mirabal’s eclecticism, his warmth and audience rapport, and his choice of instruments are part of Jamie’s music, but I added more and flipped it culturally, so I have an Aboriginal Australian who plays didgeridoo but also plays Native flute, and other flutes. I heard a collaboration that Carlos Nakai did with a musician who plays shakuhachi, the Japanese bamboo flute, and the mix of ethnic flavors fascinated me. The music scene in Santa Fe is full of performers who do some original, out-of-the mainstream things. So I’d say Jamie’s music emerged from the nature of music in Santa Fe—opera, blues, indigenous music, jazz, folk—everything. I should add that Santa Fe has some great alternative country bands, but as you can see in Snake Face, Jamie is not influenced by them. SAT: I know that you’re working on Book 4 of the series. How many more are planned? Do you have a fixed end point in mind for the end of the series, or will Mae continue indefinitely? AF: I enjoy series that take the protagonists through major life changes. Hillerman’s Chee and Leaphorn, and Barr’s Anna Pigeon, are good examples. They grow older and wiser, go through relationships, losses, and renewals, and stay interesting. Book four is with its third round of beta readers right now. Book five is well along, book six is up to chapter twelve in the first draft, and I have ideas for at least the initial disturbance that starts the plot spinning for several others. I don’t have a fixed endpoint in mind, but I do want to wrap it up and give it an end when I get close to my own, if I get some forewarning. This is something I thought about when James D. Doss died. I could tell from his final book that he knew it was the last, and he wrapped up Charlie Moon’s ever-struggling love life finally, though not Sarah Frank’s training as Daisy Perika’s shaman’s apprentice. Over the course of the seventeen-book series, Sarah grows up from a spiritually gifted child to a college student. I wanted one more book—no, a lot more—in which Sarah would come into her power as shaman. I admire that kind of story line. Mae is twenty-six at the start of my series and I like to picture what she’ll be like in her thirties and forties. As she becomes a more established and experienced healer and psychic, the kinds of mysteries will change. I have a sense of what she’ll be doing as her life moves forward, and it looks so interesting I don’t think I’ll run out of plots or characters. I may take occasional breaks and work on some stand-alone books, but Mae should be around for decades. SAT: That’s good news for readers! Thank you, Amber, for sharing your thoughts. To learn more about Amber and her books, visit her website at: http://amberfoxxmysteries.wordpress.com/. Snake Face, the third Mae Martin Psychic Mystery, has just been released. Shaman’s Blues, the second in the series, is the deserving recipient of a B.R.A.G. Medallion award. “Love is a mystery. Every person is a mystery. Every life hides a secret.” So reads the tagline for Amber Foxx’s new Mae Martin psychic series, which further advertises, “No murders, just mysteries.” These books don’t fit neatly into any genre, a plus in my opinion. Ms. Foxx writes about deep things in life—love, vocation, where each of us fits here on the earth—but she writes about them in page-turning prose that involves us deeply with each of her full-realized characters. These stories are hard to put down, engaging the reader at multiple levels. On the most mundane, we want to know what happens next; the narrative is unusual and gripping, not in the sense of a “thriller” with car chases and life-threatening scenes, but in a deeper sense, as Mae struggles with life-defining decisions as her reawakened psychic abilities conflict with the safe, comfortable life she has established with her loving family in small-town North Carolina. In this first book of the series, aptly titled THE CALLING, Mae’s psychic gifts refuse to stay hidden as she feels repeatedly called to exercise them in the service of saving lives, both human and feline. Initially, Mae feels a calling to simply become more than a mother and housewife; a chance opening for a physical trainer at the local gym prompts her to apply, but the job requires a short course taught at a nearby college followed by an exam for certification. Another seeming chance has Mae catching a ride to the college with a woman whose studies include a course in psychic phenomena. Mae’s ride encourages her to sit in on the course, and suddenly Mae is finding interest and encouragement for an ability she has previously been taught to keep hidden. As events unfold, Mae finds her life spinning out of control, decisions escalating until they’re out of her hands. Lost in new territory, suddenly danger looms on every side. THE CALLING is a book you don’t want to miss and that you will be unable to put down. Love is a mystery. Every person is a mystery. Every life hides a secret. SAT: THE CALLING, the first book in your Mae Martin series, is such an original and fresh story. What sparked the idea for the series? Did it start with the character of Mae or something else? AF: The idea started in several different ways. The part of me that that loves mysteries created a red-haired heroine named Mae Martin back when I was a kid reading Nancy Drew books. I wrote a little mystery book when I was eight or so and sent it to my grandfather. He was a poet and English professor, and he encouraged me to keep writing. I don’t remember the plot but I remember Mae’s name and hair color, and that she lived in a trailer. The part of me that likes to explore mysterious phenomena taught a course like the one Bernadette and Charlie teach in The Calling. The more I read in the research literature on psi or parapsychological events, even though they are subtle and undramatic when described in scholarly journals, the more I was intrigued by the way reality isn’t what our practical everyday minds take it to be. The spark to start writing The Calling came from my frustration over the unprofessional behavior of a colleague at a college where I was teaching. He seemed immune to getting into trouble over it. The character of Charlie gradually formed from this. I didn’t know what to do with him, though. For a long time all I could see was an image of his office door. I finally opened that door and went in and started writing to see what was inside. Result: the long-discarded opening scene of the first version of the book. The other two parts of my writer-mind showed up and brought in Mae and the mysterious phenomena, though in that scene Mae was nothing but a phone number on a scrap of paper on Charlie’s desk. As for writing murder-less mysteries, that idea had been on my inner back burner for maybe a decade. Life is full of mysteries, but most of us, if we’re lucky, will never encounter murder. It’s hard to justify an amateur sleuth’s involvement in murder after murder. Some authors succeed with it, but I’ve read others who don’t. After the first version of what became The Calling I set it aside and experimented with a sequel that involved murder and embezzlement and all sorts of crimes, because that’s what mysteries are supposed to be about, but I didn’t enjoy it. I didn’t want Mae to be around a lot of violence and crime. It would change her in ways that I feel would hurt her. That’s not to say there may not be some darker books in the series, but no murder mysteries. Life is tough enough without finding bodies all the time. SAT: Where do the various spiritual and psychic practices and experiences in the book come from? AF: A combination of research and personal experience. Santa Fe and Truth or Consequences attract a lot of alternative healers. I also met quite a few people who did this kind of work when I lived in Norfolk. I participated in an exploratory group of women healers there. A crystal healer I met in that group intrigued me, so I read about the uses of crystals and started collecting and using them. Virginia Beach has the Edgar Cayce Center, and that attracts a number of psychics and healers, some questionable and some genuine, to that part of the world. 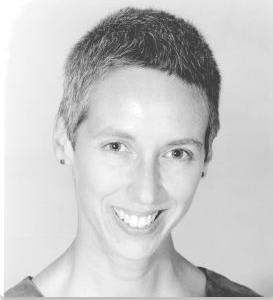 I’m a yoga therapist, and part of my training with Integrative Yoga therapy involved energy work with the chakra system, as well as Ayurveda, anatomy, psychology, mudras, meditation, pranayama, and adaptive yoga practice. A fellow yoga therapy trainee and I had profound psychic exchanges while practicing energy work on each other. Each of us saw images in the other person’s body that reflected psychological issues neither of us had shared yet. The Apache material is mostly from personal contacts. I had a friend who was an Apache medicine woman. She shared as much as she might with an outsider to the tribe. I’ve also done some reading. T or C being former Apache land, our Geronimo Springs Museum sells a great selection of books on Apache culture and spirituality. The Psychic Science post on my blog http://amberfoxxmysteries.wordpress.com/2014/01/10/psychic-science/ lists a number of books and journals on psychic phenomena and healing. I didn’t mention Shaman’s Drum in that, though it’s in the works-cited page for The Calling. Sad to say it’s gone out of print. Shaman’s Drum, the Journal of Experiential Shamanism, was fascinating. I’ve kept all the back issues and use them for reference for various practices that come up. For some of the more off-beat things, I like to walk around Santa Fe and pick up flyers and brochures for various practitioners, the stranger the better. Don’t take me wrong. I love the alternative healing culture of Santa Fe. I just get a kick out of how truly remarkable a few parts of it are. I marvel at what’s out there. Muffie in Shaman’s Blues was inspired by an encounter I had in a restaurant in Santa Fe many years ago. SAT: Where did Mae come from? In what ways does she resemble you? In what ways is she different? AF: She is based mostly on a close friend from the mountains of North Carolina who disliked living in Northeastern North Carolina. An odd coincidence is that after I wrote certain things, my friend would have those things happen in her life without knowing I’d written anything. 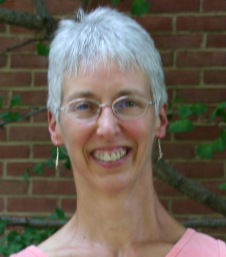 She wasn’t a healer when I first wrote the book, but then studied Reiki. Other events in her life have followed events in the series in progress, too. After I wrote them. I didn’t tell her she’d inspired my protagonist until the book was published, so it’s truly coincidence. She took it as the compliment it was meant to be. Mae is my only character who I could say is that close to a single individual, and even then, there are a number of differences. The only way Mae resembles me is her love for running and her work as a personal trainer, something I did for many years. Otherwise, we’re different. Mae loves being a mama. I never wanted children. Mae has little education. I have four college degrees. Even my psychic abilities are entirely unlike hers. (See Are You Psychic.) It works for me to have my protagonist inspired by someone I know well and think the world of, someone I hold in unconditional positive regard through all her life’s journeys. SAT: During the course of the first book, Mae has to make some difficult choices. As someone who read an early draft, I know that some of these choices and situations changed as you continued to revise. Without giving away too much, can you tell us how you wrestled with that as a writer? AF: Once I decided to tell the whole story in her point of view rather than use Bernadette, Randi and Dana as POV characters, the conflict and loss and growth had to take place centrally in Mae’s life, and secondarily in the others’ lives. In the first version, Mae’s role was a psychic tracking down a missing person. Mae’s personal growth took place as part of the story but at very little cost to her, overall, while Bernadette and Dana had big life changes. I had to raise the stakes for Mae in the revised version. I wanted her to be a character readers would follow for a series, which meant they had to be rooting for her through some major struggles. I had to make her life more complicated and challenging. One way I did that was to change Mae’s stage of progress as a psychic and healer. In the first version she was well established and comfortable with her abilities. She’s a beginner in the final version. Instead of being exclusively a mystery, it also became, as one reviewer put it, Mae’s “psychic coming-out story.” I added a mystery in her own life as well, about her family. Her mother had always been in the back of my mind, the way an actor creates a biography for a character she’ll play without that story ever being in the script. Bringing Rhoda-Rae onstage, rather than storing her in the unspoken offstage space, was a key part of setting up the central conflict about Mae’s gift. The original missing person plot became a subplot in the story of Mae’s calling. My critique partners deserve credit for helping me see my way through all these changes. 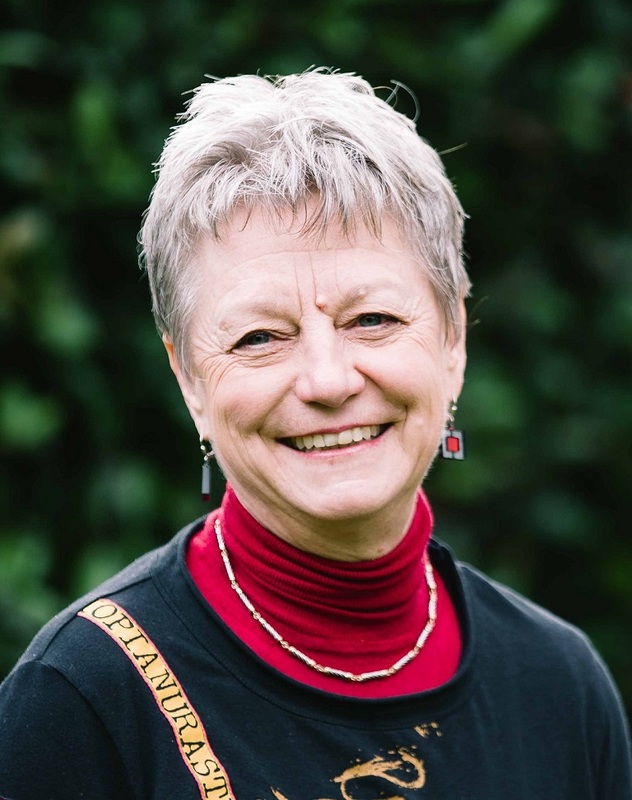 SAT: One of the things that appeals most to me on a personal level is the mixture of acceptance and skepticism that Mae brings to her gift and to her encounters with the new world of spiritual reality that gift opens for her. I like the fact that Mae is a strong and independent person who isn’t easily taken in by spiritual charlatans, a type that can be found in any setting from the most traditional church to the most New Age sort of movement. At the same time, she is eager to learn from those who demonstrate wisdom. How much of that reflects your own personal beliefs and approach to spiritual matters? AF: That does reflect my beliefs and approaches to spiritual matters, but there is a big difference. I had that outlook delivered the easy way, though positive role models. Mae learns it the hard way, through seeing negative role models. My father attended the Episcopal church, and my mother usually slept in. Neither said the other was wrong. They were open-minded about spirituality, and shared a sense of humor about it. When I was in my teens and exploring yoga and Buddhism, my father told me about his journey of choosing a church by going to every Christian denomination he could think of before settling on the one where he felt at home. He had faith, but it wasn’t solemn or dogmatic. I remember driving somewhere with him and laughing together at a radio evangelist who was selling “prayer cloths,” pieces of fabric this man had prayed over that were supposed to work miracles if you put them on your body. This preacher, who presented himself seriously to his followers, was one of my father’s comedy favorites. Later that year she kicked me out of religion class for asking what would be left of the church if you took away all the rituals. I never got the answer, but I got an extra study hall for the rest of my years at that school, and never had to go back to religion class. My parents didn’t mind. I’ve been lucky to find real spiritual teachers—an Apache medicine woman, Micmac and Cree elders, some of my yoga and meditation teachers, and a Taoist-inspired Episcopal priest. What they all have—or had—in common (one of these teachers has passed on) is the same thing my parents had: a sense of humor, and acceptance of other traditions. Over the years I’ve met people who were convinced of things I found hard to swallow. I’ve tried respond to their unusual beliefs with an open mind that looked very carefully at what comes into it. After all, people don’t always believe that some of my experiences could be real, either. SAT: The second book in the series, Shaman’s Blues, is dominated by the character of Jamie, surely one of the most memorable creations I have encountered between the pages of a book. Where did he come from? AF: I don’t know. He showed up. I didn’t invite him. He has a life of his own. It even surprised me that he was Australian. I had to do a lot of research to understand him so he could come through authentically, but I didn’t consciously invent him. Even people from his past seem to have showed up whole. He first popped up as a minor supporting character about five chapters into the first version of Soul Loss, which is now in major revision as book four in the series. It was going to be book two or three, but he began to take up too much room. It took me a few messy, unfinished books to realize what I needed to do with him. Strangely, since his character was so intense, I didn’t have a clear idea what he looked like at first. Then when I was reading a book about Australian life and culture I found a picture of this extraordinary face. It was as if I recognized him, not just his features and his hair, but his expression, his smile, and the way he was looking up at the camera. That’s Jamie. Everyone who’s read the book pre-release has had a strong response to him. One of my beta readers called him “the loveliest, most frustrating, and most complex character” she’d ever read. If there really are characters in search of an author, I’m grateful he chose me. I think of him as a gift I’ve been honored with the care of. Thank you so much, Amber! This is fascinating stuff. When an extraordinary ability intrudes on an ordinary life, ready or not, everything changes. A down-to-earth North Carolina country girl, Mae Martin-Ridley is a former high school athlete whose interests run to sports and fitness, not spirituality or mysticism. The last thing she ever expected to be was a psychic or a spiritual healer. Obeying her mother’s warning, Mae has been hiding her gift of “the sight” for years. When events compel her to use it again, the unforeseen consequences spread to affect every aspect of her life—work, marriage, and family. To qualify for a new job Mae takes a class in Norfolk, Virginia, where she meets people who not only accept her abilities but push her to explore them further. She struggles with the shadow side of her gift. Though she wants to use “the sight” to help people, it gives her access to secrets she could regret uncovering. Torn between those around her who encourage her and those who condemn or doubt, Mae has to find her own path. Her new neighbors are under the influence of an apparently fake psychic who runs the health food restaurant where they work. When Mae questions the skills of the peculiar restaurateur, the woman disappears—either to Santa Fe, or another dimension. The restaurant’s manager asks Mae to discover which it is. Finding two missing people proves easier than finding out the truth about either of them, or getting one of them, once found, to go away again. If you enjoy mysteries and suspense with a touch of paranormal, you will want to put L.L. Bartlett’s Jeff Resnick series on your list. You should read the books in order to get the maximum enjoyment, for much of the interest comes from the characters’ personal lives and changing circumstances. MURDER ON THE MIND, the first in the series, introduces us to Jeff, a regular guy whose life changes forever when a vicious mugging leaves him with some permanent side effects: the ability in certain cases–not all, to share others’ emotions in an unpleasantly visceral way, plus weird visionary flashes that eventually lead him to investigate and solve a murder. BOUND BY SUGGESTION, the 4th and latest in the series, is structured a little differently from the others. Rather than a who-dunnit, it is a psychological thriller. We know the “bad guy” early on, and the considerable suspense comes from wondering how far the baddie’s twisted plot will go before Jeff starts to wise up. A secondary plot involving Jeff’s half-brother, Richard, and a second “bad guy” keeps the reader on her toes, wondering how it will all pull together. I’m normally pretty good at leaving books, good interesting books, in my backpack at the end of the day’s commute, but I was only halfway through BOUND BY SUGGESTION before I HAD to take it out and read it over dinner and then stay up way past my bedtime to finish it. It was worth the lost sleep. The only downside is that now I’ll have to wait until the talented Ms. Bartlett gives us the next Jeff Resnick book. Meantime I’d love to get some suggestions for other paranormal/mystery/suspense reads. I’m sure there are plenty out there.